Mohamed AbuTaleb serves as the Imam of the Islamic Association of Raleigh. He is a lifelong student of the Quran and Islamic studies, has studied with a number of credentialed scholars and teachers and has been blessed to memorize the Holy Quran. Mohamed has pursued seminary training through the Cambridge Islamic College and Al-Salam Institute in the United Kingdom, and studied under teachers trained at Islamic universities in India, Saudi Arabia, Syria, Jordan, and Egypt. Mohamed also shares a love of science and reason and completed his Ph.D. and Master's degrees in electrical engineering from MIT along with degrees in physics and mathematics from the University of Maryland. 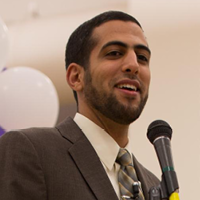 ​Imam AbuTaleb has traveled the United States extensively as a lecturer, trainer, and educator. He serves as an instructor for the OakTree Institute and has collaborated with a myriad of organizations and institutions. He shares his love of learning with audiences at an array of universities, community centers, and places of worship. His style enables audiences to couple transformative understanding with relevance to daily life, and to cut across labels and divisions through scholarship and dialogue. Previous lectures from Harvard, MIT, Columbia University, Georgia Tech, and many others can be found on his YouTube, Facebook, and Twitter pages.